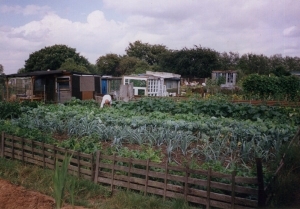 Manor Gardens Allotments were more than 100 years old. The allotments have been swept aside to make way for a walk way for the Olympic games, an event lasting 4 weeks. The Olympic Delivery Authority claim the London 2012 Olympics will be the greenest yet. Despite alternative proposals from the plot holders the allotments have been destroyed and the plot holders relocated to Marsh Lane, a site on Lammas (common) lands on the otherside of the Lea Valley. The new site is like a UN refugee camp with identical sheds. It is also water logged due to the need to seal in polluted soil with an impenetrable membrane, so many plot holders cannot cultivate their land due to flooding. The plot holders have been promised they will be able to move back to their site after the games.